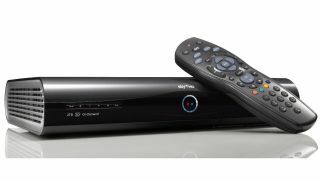 Sky has announced a new version of its Sky+ HD box will arrive later this year, bringing built-in Wi-Fi connectivity for the first time. The broadcaster currently brings on-demand access to a wealth of on-demand content and apps, but the current set-top box requires users to be tethered to their broadband connection via an Ethernet cable. The new boxes, which will be issued as standard to new customers from September should end the hassle of positioning the mobile router close to the set-top box or trailing unsightly cables across the living room. "This will ensure every new customer will be connected automatically, and we'll also roll out this box selectively to existing customers who don't yet have an HD box," said Sky's Jeremy Darroch. Existing customers won't miss out on the wireless goodness as Sky also a Wi-Fi adapter, similar to the Xbox 360 accessory that allows connected viewers to cut the cable. The company intends to make that device more available to subscribers with a "low cost" price tag, in a bid to get more customers connected via their broadband. The connector is currently available for £21.99 from the Sky website, but given the company just launched a fully-functional Now TV set-top box for just a tenner, we expect that price to come down. RIP Roku: Hands on with the new £10 Sky Now TV set-top box.